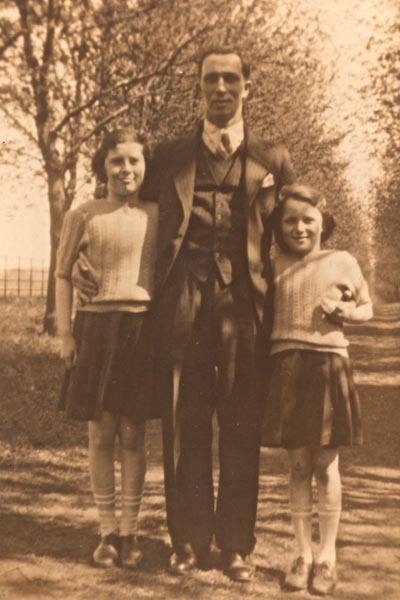 I was an evacuee to Chorleywood house at the beginning of the war. I don’t know how long I spent at Chorleywood House, it seemed a long time. I remember a field of daffodils. I was just seven when I came, my sister three years older. Our Mother came with us to see us settled in. My first memory was walking in the front door to see a long table with slices of bread and jam; of course we were all hungry. The local school was full so we had lessons in the church hall, very cold, and the bottles of milk had ice in them. Another naughty memory I have, after we had been there awhile, there was an orchard very near – don’t think it belonged to the house. A group of us decided we needed some apples so we decided to go scrumping. I was voted to go over the wall whilst the remainder stood outside to keep watch while I threw some of the delicious apples over to them. I daresay we suffered tummy ache the next day. I think we were at the house for quite a while (from what I understand most people weren’t happy to have siblings). There was a group of Brownies at the house so we had our meetings in a hut in the grounds. Because we all lived together our uniforms were often mixed up especially hats and at some point I caught ringworm and in those days you had your head shaved – I was devastated. Eventually we went Catlips Farm, we weren’t happy there and so my mother managed to move us to a Mr & Mrs Walker who lived at Langsett, Chorleywood Bottom. We were very happy there and kept in touch with them after the war. There must have been a big pond or lake on the common because one winter’s day we took the Walker’s dog for a walk and she ran onto the ice and fell in. We were so frightened but eventually we got her out. When we went to Langsett, their son was still at home so we shared a bedroom with Catherine (how generous was that!). I remember being fascinated watching her brushing her hair 100 times every night. They always made my parents welcome when they came to visit. 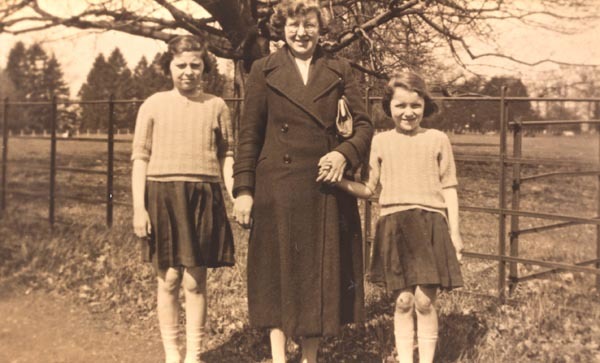 The photos below, most likely taken at the top of Pink Chestnut Avenue, show Elizabeth (Betty) with her mother, father and sister.